Over the past few months, armed with a newfound confidence that seemed to spring from my post-exam europhia in alarming abundance, I’ve grown dead comfortable in my own shoes and frankly love meeting everyone and anyone. I strike up conversations with people waiting in line for coffee, I allow the person asking for the time follow up with questions about the copy of Dr. Seuss I’m reading, and I hardly bat an eye anymore when that handsome waiter comes over bringing trays of appetizers “on the house,” “just ’cause.” I’ve noticed that freebies tend to be a side perk of being friendly, and as a wallet-scrunching grad student, I’ll take what I get. Possibly my favorite part about staying open-minded about random encounters, though, is the potential for hilarious stories to tell all your friends afterwards. Most recently, I walked into a Starbucks and spotted a really good-looking guy about my age sitting at one of the counters with a laptop. On a scale of 1 to 10, he was a 9.5–Zac Efron meets Orlando Bloom and bonus points for the clean shave. After about 5 minutes of fiddling with my bike outside debating whether or not I should leave (as I had planned), I finally made the decision: I bolted my bike lock, strode determinedly back to the door (slapping on my ‘Hi my name is Ala and I’m friendly not psychotically over-deliberative’ face in the process), and plopped myself onto a stool next to his friend, where we struck up conversation about who knows what–and frankly, I didn’t really care what. It might have been about his college’s finals or something. Anyway, about a minute into this conversation, he looked up from the other side of his friend, caught my eye, and smiled at me. Ignoring the impending swoon that threatened to keel me over like a dehydrated dandelion, I smiled back and asked him if he, too, was a student. This sent us spiraling into a whole other conversation (he was a business student, he lived not too far away, and we both loved coffee shops) and before I knew it, we had been chatting for near ten minutes. It was about this time, however, that we hit our first lovely bump. Him: Sooo, your last name–what is it, Chinese? Him: Oh, very cool. (beat. Then, proudly) I’m half Japanese, too. Me: …Oh. Uhhh. Really, is that so? Him: So we have a connection there. Call me crazy, but last I checked, Japan and China were two entirely different political, cultural, socioeconomic creatures, bro. Strike 2 came pretty soon after–and like the aftershock of an earthquake, it came in with some pretty hefty speed behind bump #1. Anyway, the takeaway from this short anecdote is that people really do say just the strangest things. However, if you never take the chance and open up to new meetings with strangers (cute or not), you’ll never know what funny, strange, wonderful conversations you might have missed as a result. My friends and I got a good laugh out of it for a whole day afterwards, so if nothing else it made for a good story! Regardless, make them! More substantive conference shenanigans to come on Wednesday! 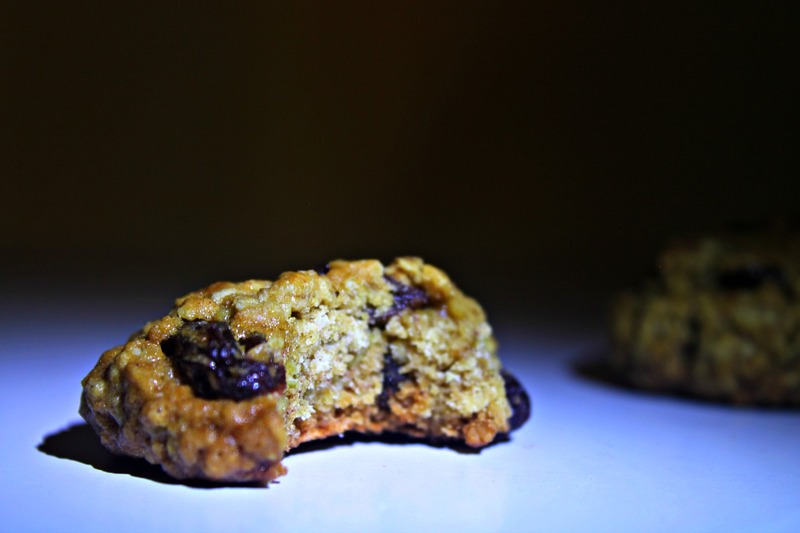 The chewiest, classic spiced oatmeal raisin cookie recipe you'll find out there! The wonderful combination of subtle warm spices and sweet plump raisins will make you melt in your shoes! In a large bowl, cream together butter, brown sugar, and white sugar. Gently mix in flour, baking soda, cinnamon, nutmeg, and salt until just incorporated. Scoop out cookies into 1-inch balls and drop 2 inches apart on prepared cookie sheet. Bake in preheated oven for 10-12 minutes, until outside has set and turned golden brown (but not overly hard). Allow to cool completely on sheet (on stovetop) before transferring to a separate plate. Fun story. Odd (as you know) but fun. I like the photos – this is a fun style. I’ve not painted with light (I know how to get a similar effect without doing it), but I like it. However, may I offer — kindly and gently, I hope, and certainly well meant — a suggestion? The pictures are all a bit soft. I’m guessing you don’t have a tripod, and just propped the camera on something? Or am I wrong? If I’m right, do invest in a tripod and decent head — it’s so worth it (almost every photo on my blog is taken on a tripod). If you are using a tripod, somehow the camera isn’t acquiring proper focus, I’d focus manually (switch it to manual, focus, then leave it there as you paint with light). And if you focus manually, I’d stop down to maybe f9 or so to get slightly better depth of field (and to help your chance of acquiring proper focus). I really do like the photos, BTW — cool style. Definitely want to see more of it. Are you kidding–this is exactly the constructive advice I’ve been looking for! Feel free to PM me with similar tidbits anytime, John: I even thought of you because you’re the master at shooting in dark backgrounds. This was an experimental shot for our last photography assignment and embarrassingly, I have a tripod and didn’t use it 😉 I was pretty lazy and I’m glad you pointed that out so I’ll stop neglecting it–in short, I am eternally grateful, and never hesitate to keep it coming! Oh my gosh I am dying over here. You don’t look Chinese at all? Seriously? He said that? Unbelievable!! Cuteness isn’t everything apparently. Having a brain sometimes need to go with it lol! Who knew :p I love these pictures. So interesting and can I say cool? Yeahh, I forget how disappointing it can be when a cute face spouts that nonsense–too bad! And thanks for your generous comment about the pictures–too generous though, as these are totally experimental (and, as folks have pointed out, a bit blurry!). But yes, I’m so glad we can empathize with one another, hah! LOL….what a conversation. Cute guys aren’t always the brightest :/ But hooray for you taking a risk. Baking up your cookies would only be a risk me for inhaling both the dough and cookies! How did I miss this post?! I thought I was being a sufficiently competent internet stalker by checking your blog every day but I totally dropped the ball this week. Ahhhh, the good ol’ “but you don’t look Chinese” line (I’ve gotten that before). Well, as long as I look human and female, I’d say I’m winning. Or the ol’ “What ethnicity is that last name?” What does it matter? I figure those guys don’t have too many interesting things to say and just fell back on talking about race. And I guess China & Japan are in Asia, therefore you totally have the whole ASIAN thing in common. I shouldn’t be so snarky. So long as they were friendly and you didn’t feel any ill-will from them, I guess it’s harmless…although they need to work on their game better. Good on ya for taking a risk and talking to them. As for “painting” with light, what a cool idea! 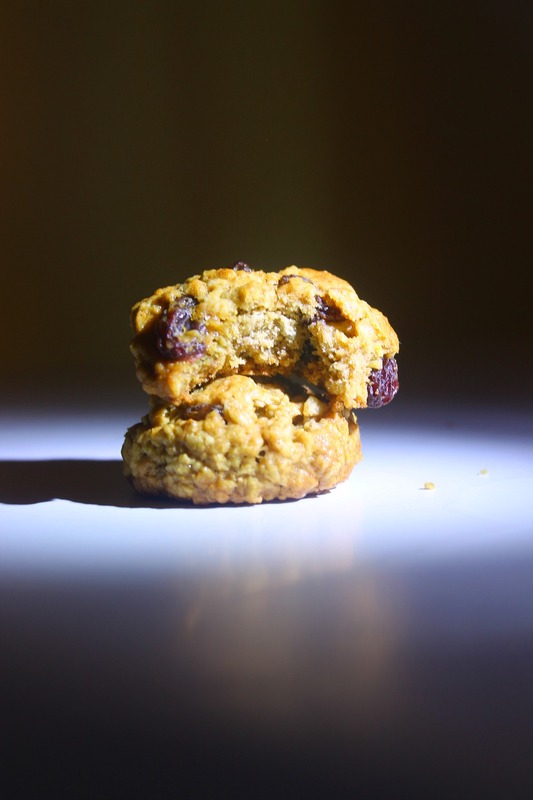 These photos look fab and they truly spotlight how delicious your cookies look. Fail-stalker, fail! Just kidding–crazy week for you too, huh? Lordie and gracious, I’m almost embarrassed to have posted this post but I was at a conference and had all of ten minutes to edit photos + write the post + post it. Ergh! It was totally worth it just for your comment, though–suuuuch good material that you’ve articulated way better than I have (unsurprisingly)! These boys need to step up to their A game, that’s for sure. And thanks for being so nice about the photos, though (as other nice folks have pointed out) they’re pretty soft and blurry. Ah, well! Ten minutes this time, more the next. Thanks, missy! These cookies look great (excellent texture) and I really like the fact that they’re egg free. I am amazed at some of the things guys have said to me with a tone and/or expression that clearly shows they expect me to be impressed or charmed. Most of the time, I’m actually thinking they’re odd or idiotic. Still, as you said, at least they’re entertaining while you wait in line or for a bus, whatever. And once in a while, someone will surprise you and you make a new friend. haha! I’m so glad we agree–I can stay amused for about an hour or so, but I think that’s my limit with cute-but-nonsensical people in general. Speaking of random encounters though, I met another guy just this weekend and we followed up, and it was a total blast! So that just goes to say that these things do go in funny directions. And YES, thank you for pointing out the photo thing (as one other kind reader did)–as a non-excuse, I photo edited these but worked on these photos for about a total of one minute because I was SWAMPED at a recent conference…so I basically knew they were crappy quality and posted them anyway. Ugh. Still, it was a fun project and I finally decided to share them with y’all, though it’s probably a one-off for me. So glad you are honest about it though, it’s so refreshing to hear that honesty from folks! Cheers, Tifa! Hahaha we are totally in the same boat–the darkness line used to haunt me everywhere when I was a swimmer with the darkest of dark skin! And I know what you mean when you talk about not having time for that cooking/baking/photographing (though your photos are amazing, so hah!). I’ll let you know if I ever do find the secret 😉 you share, too, yeah? Cool interesting concept “Playing with light” as you said produces some stellar contrasts with light and dark. I would love to see some more. Aw, thanks Jess! I don’t know how many more of these I’ll be doing, but it certainly was fun not having to depend on the sun to do my photography 😉 I bet you can imagine what a relief that was. Have an awesome weekend, girl!